"Wow! Five years?!? You sailed for five years! I could never do that!" By far, this is the most common reaction we get when we tell folks why we haven't been around for the last five years. While we are exceptionally fortunate, for us, great adventures were a conscious choice. We consciously chose to sacrifice many "normal" pleasures in exchange to see the world. 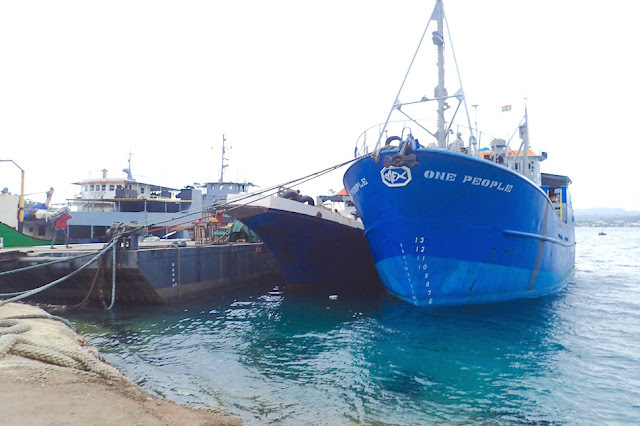 We could've traveled with far greater comfort, faster, longer and partaken in far more adventurous tours. Never Never Tours truck looking far seedier than its famed 1986 film days. Northern Territory, Australia. We didn't always hit it -- certainly not with our major repair work in New Zealand, nor when we completed our circumnavigation of Australia by Land Cruiser. When the fuel costs up to $5.00 USD/gallon, and we drove over 10,000 miles, we knew we wouldn't be able to keep our spending as low as usual, not to mention all the other expenses. We free-camped a lot (Camps 8 and wikicamps were indispensable aids for finding free places, though most were primitive and "out there" or rest stops just off the highway). 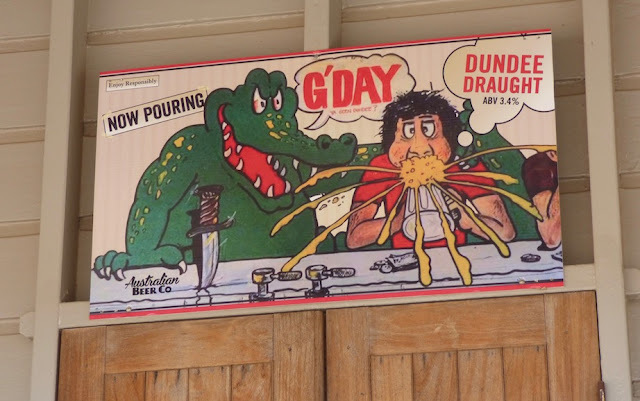 This comical Dundee Draught sign ticked our funny bone, but not our wallet. Northern Territory, Australia. We did stay at paid campsites when we arrived late or just really wanted a flush toilet and shower or it was the only choice to stay in an awesomely cool park (like in El Questro); that generally ran us ~$25 AUD (~$18 USD). 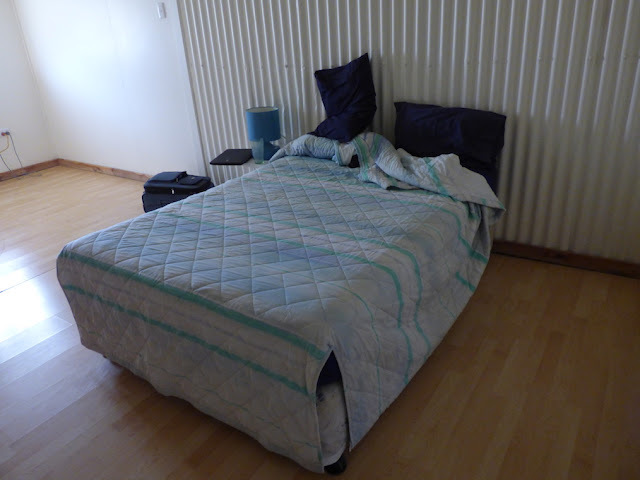 When we felt "really indulgent," we'd spring for a backpacker lodge private room with a communal kitchen and bathrooms; that tended to run us ~$70 AUD (~$50 USD). How much would you be willing to pay to stay in lovely rooms like these? Walkabout Creek Australia. As we neared the end of our travels, given all the bypassed "special days" (birthdays, anniversaries) traditionally BC (before cruising) celebrated with an overnight staycation, we found ourselves really itching for a bed, despite our typically tight budget. Ok, there was access to this kitchen included at the Walkabout Creek Hotel. We kept driving. We were ready for a big splurge. 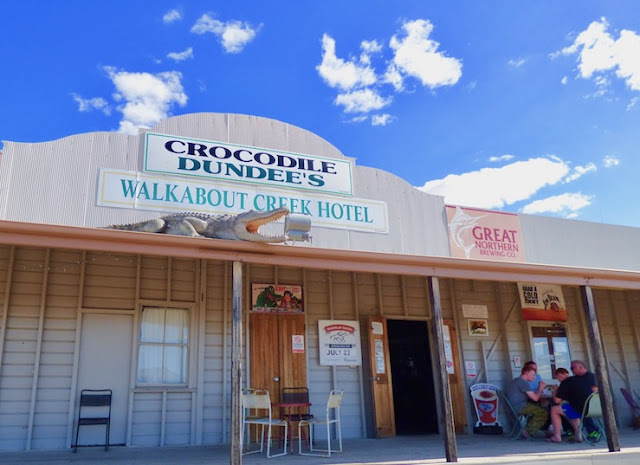 We passed up the infamous Crocodile Dundee Walkabout Creek motel as we edged our way out of Australia's desolate and dusty Northern Territory. We briefly considered staying, but were put off by the "We don't normally rent to people" comment from the proprietor, who meant they generally rented to "tradees" (blue collar workers). We weren't too sure what made tradees subhuman. Maybe it was their willingness to rent in such a dilapidated place? We just weren't up for popping $110 for such a depressing-looking spot, famous or not (though Wayne said the bar was cool). Instead, we free-camped further down the road that night. The timing was right for stopping here, at the Blue Heeler Road House, Queensland Australia. The options were few and far between. 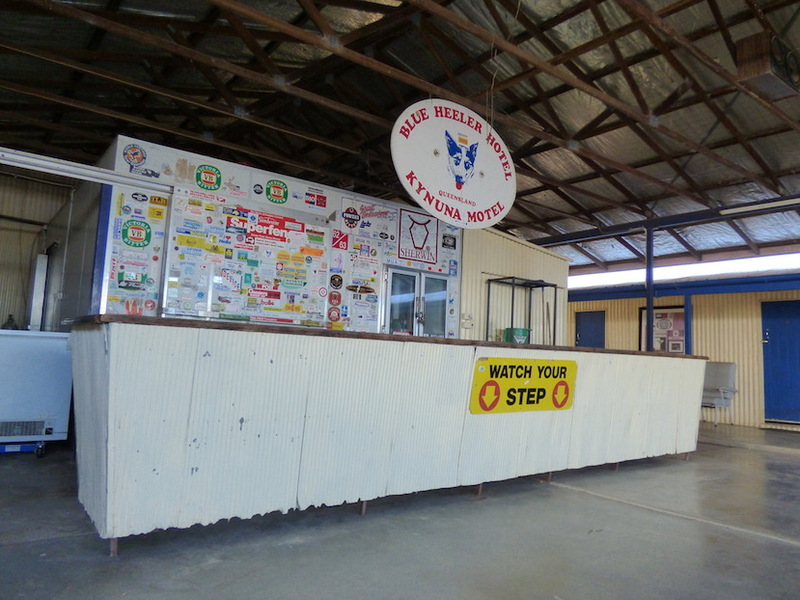 Two nights later, in Kynuna, Queensland, we reluctantly sprang $120 AUD (~$85) for a very rustic room at the Blue Heeler road house. While the staff was friendly, and I got the eve meal special, a tasty roast beef sandwich for a song, the rooms won the prize for the worst room we've ever had, anywhere - and we've stayed in some real dumps - for half the price. The walls were corrugated metal. The floor was soft from rot. The toilet reeked from sulfur water. Even if the bed had been clean, the florescent light above the bed attracted huge hordes of kamikaze insects who easily entered the room through the massive gap under the door. Their death throes ended on the bed. Our bed, doubling as our couch, Blue Heeler Road House, Queensland Australia's outback. 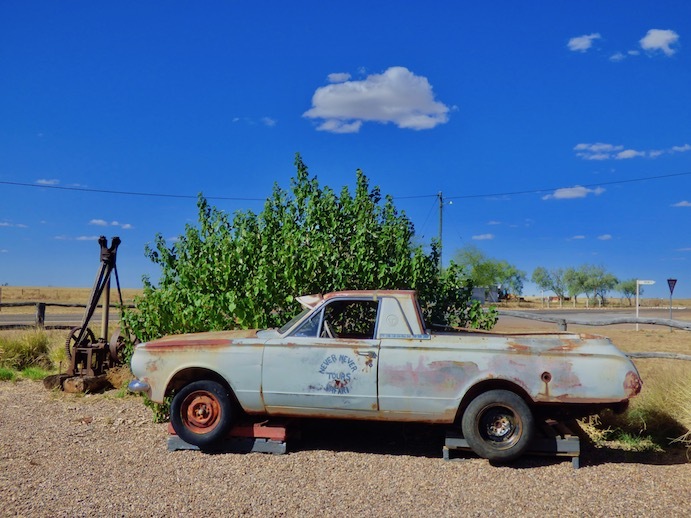 "I'm guessing that didn't count as one of those luxurious birthday-anniversary hotel rooms I've promised you for the last several years," Wayne sighed, as we checked out of the Blue Heeler. I concurred, even though it's the most we've paid for a room other than the shockingly expensive (but nice) Great Ocean Road hostel room. Perhaps the Blue Heeler did inspire Banjo Patterson's unofficial national anthem "Waltzing Maltida," but for $120/night it was still a dump. And we got lucky - the beer garden outside our door was not in operation that night. Given the semi-outdoor portion of Blue Heeler's bar was right outside our door, we were grateful that portion wasn't open the night we stayed. Two for two, famous Australian Outback road houses.... Cool pubs. Major dumps. Far too much moola for a couple looking for an affordable, clean bed as a decent respite from camping. 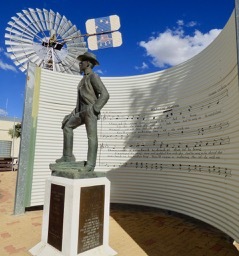 Banjo "Waltzing Matilda" Patterson Memorial in Winton, Queensland, Australia. Yet, one half day after leaving Blue Heeler -- Shangri La! 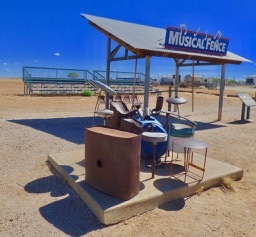 Or at least what constituted it for us in Australia's outback. Arriving in in the small Queensland outback town of Winton around noon, instead of logging another full-day's drive, we stopped, cursing ourselves for not continuing our previous night's drive to end here, at Winston's North Gregory Hotel. We stopped at the Blue Heeler because we were road-weary and also because nocturnal wandering kangaroos make it risky to safely drive at night in Australia. 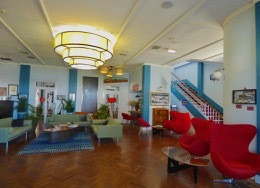 North Gregory Hotel's art deco interior, a beacon of cleanliness compared to our usual fare. Winton, Australia. The North Gregory Hotel called to us. Stylishly art deco. Clean. Spacious. "How much?" I asked. "$110." I explained that we really blew it, blowing our budget by staying at the dumpy Blue Heeler for $120 the night before. I asked if they'd consider a military discount, but that we would stay, regardless. They knocked $10 off the price for a military discount, especially appropriate given the next day was Anzac Day. 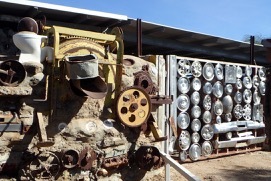 A small portion of quirky Arno's Wall, with everything including the kitchen sink, behind Winton's North Gregory Hotel. Savoring the overall quaintness of this tidy little historical town, we checked out the town's fun and funky little music fence and Our only disappointments (other than spending a night and $120 for the Blue Heeler motel prior) were we were too early in the season to check out the Waltzing Matilda Centre, not there the one night of the week the Winton Royal Open Air Theatre showed movies, and one week before the premiere of chicken racing, which might be even more funny than the crab races we saw back in the Caribbean. 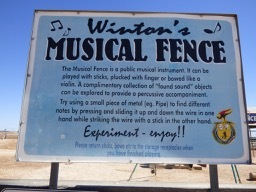 Winton's Musical Fence, a fun place to play. Designed by percussionist and composer Graeme Leak. Given Winston was one of the last places we'd stop before leaving Australia, I wandered the town to pick up a few keepsakes. Wayne luxuriated the rest of the afternoon in our sumptuous room, a double bed with an awesome mattress and sweet little fridge pre-loaded milk to go along with the complementary cookies. The room opened out to a long balcony, with Adirondack chairs. As dusk approached, settled into the deck chairs to enjoy a perfect temperatures and nearly bug-free sunset. Arno's Wall, right behind North Gregory Hotel. is a fantastical sculptural wall that even includes the kitchen sink. This is only a small portion of Arno's Wall. Winton, Australia. 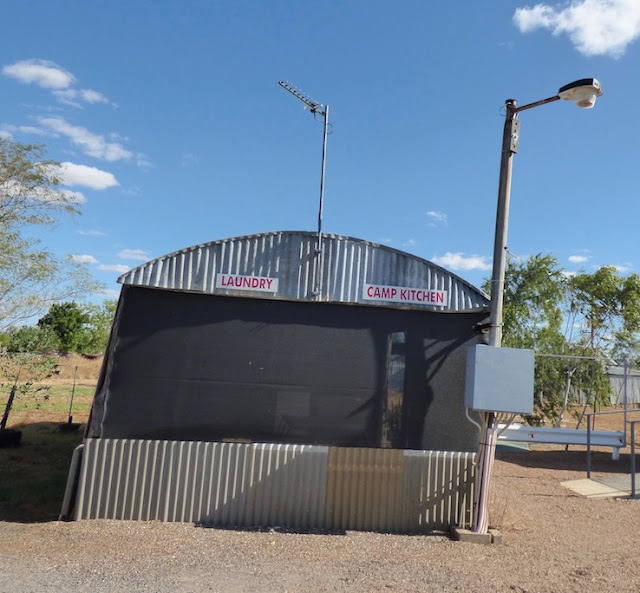 we'd be hard pressed for a better good-bye for Australia's Great Outback than a bird's eye view of a humble yet earnest small town homage to its bygone heroes. 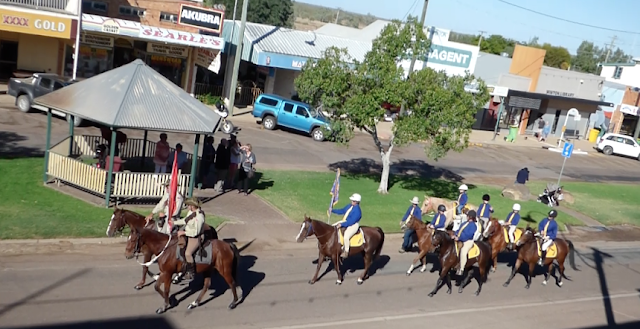 Anzac Parade, April 25, 2017, Winton Australia, viewed from North Gregory Hotel's balcony. "Did this one count?" implored Wayne, hopefully. I knew he meant. Did he finally get credit for at least one belated / missed birthday-anniversary treat? Definitely, I assured him. Most definitely indeed. This time, there was no regrets for our last big indulgence. North Gregory Hotel, Winton, Queensland Territory, Australia. Image pilfered from http://www.northgregoryhotel.com. 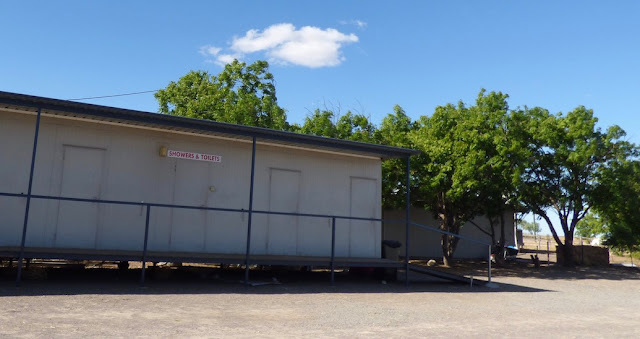 This post fondly recalls the brief time we spent in Winton, Queensland, Australia, April 25-26, 2017. Meanwhile, we're still in the throes of "re-entry" in the USA, not yet quite sure where we'll call home. Currently we are job-hunting for living-wage work that allows us to lead a simple, debt-free life and still save for the future. 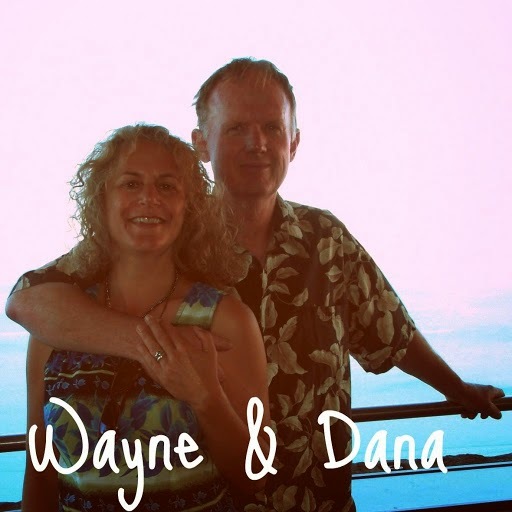 At the moment, Wayne's gracious father and his wife are providing a roof over our head in Portland, Oregon, for which we are profoundly grateful. Would've been a hoot to see these fellas racing in Winton, Australia. 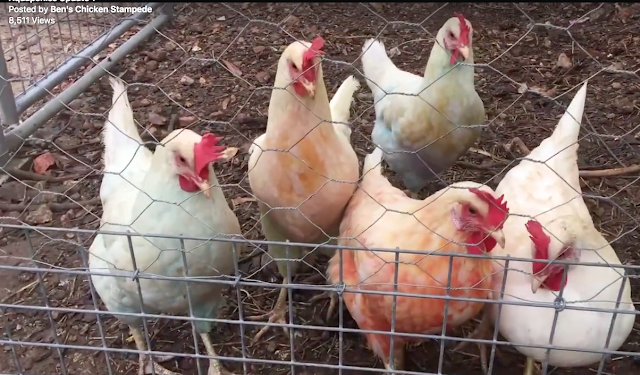 Image pilfered from Ben's Chicken Stampede video. More catch-up blog posts, blog clean-up and video shorts.